Description: Sail through the immensity of this lands and seas, where is the world biggest ecological reserve. This Chilean National Park was declared to be a worldwide reserve by UNESCO in 1979. Located at latitude 46 - 45 south of the Chilean Patagonia it is 1,242,000 hectares of millenary beauty. A Spanish navigator discovered this place four centuries ago. Today it has become one of the natural splendors of Chile, of the greatest international importance. The ice of the San Rafael Glacier date back as far as 300,000 years, its frontal face is 2kms wide and its ice towers reach up to more than 75 mts. and plunges down into the ocean waters more than 230 meters. It has a length of and stems from the San Valent�n Nevado of the Southern Ice Fields of the Los Andes Mountains. The blues of the ice and its constant avalanches have converted this natural spectacle into international fame. With its ice floes of different shapes and colors it is a spectacle that is unique in this world. There are also excursions on the fjord's quiet, transparent waters in safe motorboats, where you are shown the rich marine fauna, such as the banks of mussels and the playful southern dolphins. Sailing every Saturday from Puerto Montt, a city located 1000 kilometers (620 mi.) south of Santiago, to the San Rafael Glacier, the majestic relic of the planet's last glaciation, Skorpios carries you on a Dream Cruise of seven days and six nights. Its goes through spectacular channels and archipelagos, where an exuberant nature stands out in all its splendor and man's presence is barely perceptible, and where softly shaped islands are scattered in the ocean. We will visit isolated and picturesque fishing villages and settlements, such as Puerto Aguirre and Queilen, the city of Castro, the Quitralco fjord with its thermal baths and the San Rafael National Park, which was declared world biosphere reserve by the UNESCO with its Glacier of magical and spectacular 30,000 years old ice that rises in multicolored towers to a height of more than seventy meters and then sinks into the ocean. On board the M/V Skorpios II, you will find a friendly, personalized service, always with the exceptional hospitality provided by the Kochifas family and their experienced and well-trained crews who will offer warmth and efficiency in a unique and unforgettable cruise. You will have an enjoyable gastronomic experience, alternating international cuisine with the best culinary traditions of southern Chile, where the most outstanding are Chilean Kingcrab, giant mussels (Mitilus), mussels, oysters, sea urchins, barnacles, salmon, croaker, sea pike, kingclip, red and white meats and the juicy and delicious Curanto, always accompanied by the best Chilean wines and exclusive alcoholic and non-alcoholic beverages in the Skorpios' traditional open Bar. The M/V Skorpios II has capacity for 160 passengers, its cabins are fully equipped and decorated, all have private bathrooms, background music, intercoms and television. It also has the Quitralco saloon (smokers), the San Rafael bar (non-smokers) and a main dining room. Saturday: Departure from the Skorpios Terminal at 11:00 hrs am. Sailing through the Llanquihue archipelago, Gulf of Ancud, Chilo� archipelago, crossing the Gulf of Corcovado. Sunday: Navigation by the channels Moraleda and Ferronave, arrival at Puerto Aguirre, departure and sailing by the channels Ferronave, Pilcomayo, Costa Channel, to cast anchors at Punta Leopardos, twenty miles from the San Rafael Glacier. Monday: Cut through the San Rafael bay, T�mpanos channel and Lagoon, dropping anchor two kilometers from the Glacier. Excursions in motorboats between the multicolored glaciers, weather permitting. 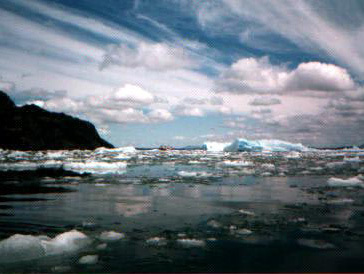 In the afternoon, the vessel moves closer to the Glacier. In the evening, departure to the Quitralco Fjord. Tuesday:Quitralco Fjord, thermal baths in covered or outdoor pools, excursions in motorboats in the fjords. In the evening, departure for Chilo� through the channels Moraleda and P�rez Norte. Wednesday:Sail through the Leucayec channel, the Chonos archipelago, across the Corcovado Gulf to arrive at Queilen. Sail through the Yal channel, the Castro estuary, to arrive at this city. Thursday:Castro, handicrafts fair, Museum, Church. An optional excursion to Chonchi. Departure at midday down the Castro estuary, Lemuy channel, Dalcahue, Quicav�, Calbuco. Gala Dinner, Arrival at Puerto Montt. Friday:Skorpios Terminal, breakfast. Anchor at the dock at 08:00 am. Disembarkation between 08:00 am - 09:00 am . Welcome Cocktails and farewell party. All the activities inside the ship. The transfers are from Balmaceda airport to Coyhaique, after Puerto Chacabuco and come back, these transfers are in busses and they take 2 hours one way aprox. According to the Program Skorpios Sea Cruises sets sail at 11:00 o'clock on Saturday. The Company offers, as an additional service for tourists arriving in Puerto Montt on Friday night, lodging on board. This includes: cocktail, complete dinner, open bar service and breakfast on Saturday. Passengers should be on board one hour before the sailing. Important: ? Aboard the Cruise Vessels is a shop with all of the articles appropriate for such a trip; rolls of film, batteries, t-shirts, hats, sweaters, parkas, etc.